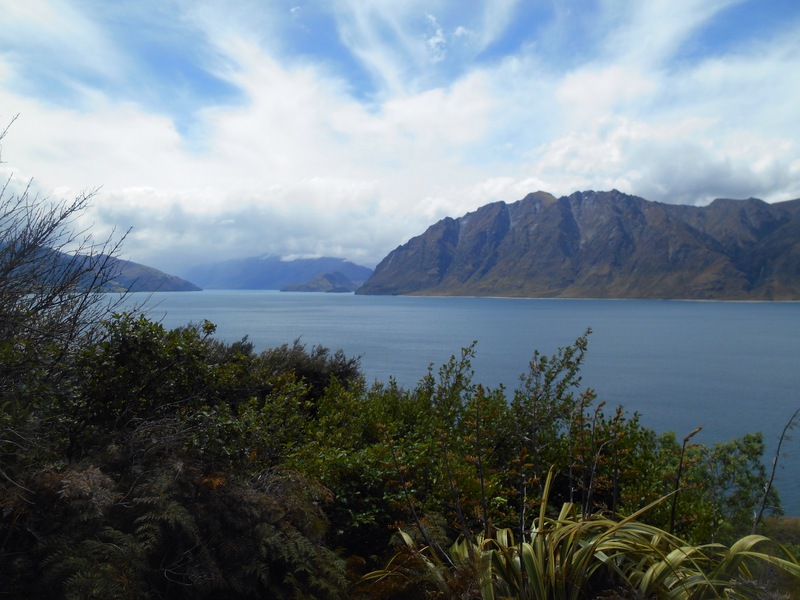 Although the power was out, the fire was lit and the kitchen was bustling early morning with cyclists and hikers, keen to see if the weather would scarper the opportunity to enjoy this dramatic landscape. We laughed out loud at the local ‘newsletter’ Roar Weekly which included jokes, gardening tips, local news articles such as the accident resulting in the loss of two cones, interviews with local residents conducted by a 12 year old and the rather sparse text in section which due to the lack of phone signal just read ‘cannot receive text message.’ We were keen on the local sense of humour! By 10:30am the weather looked clear enough to head on. Our ride took us passed fields which resembled rivers and fallen trees. 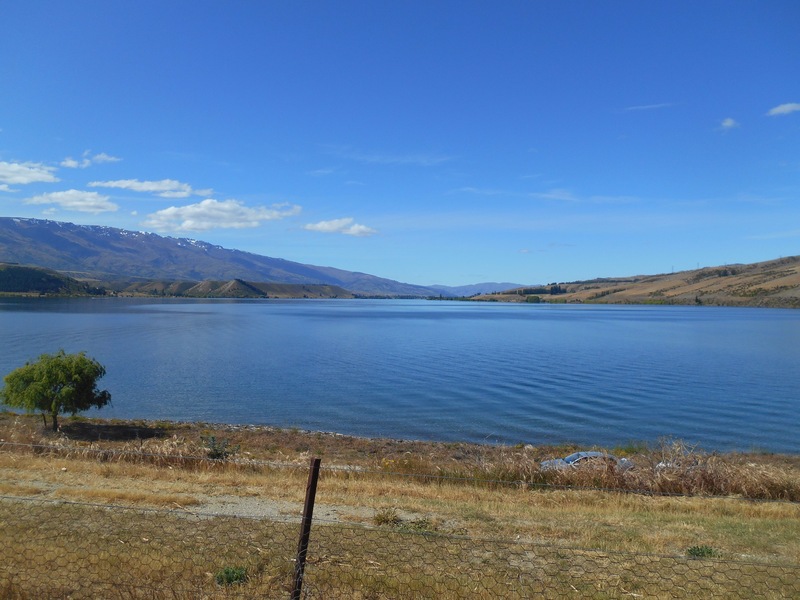 That being said, the rolling fields opened up to incredible Lake Wanaka, and we were in store for our daily ‘wow.’ The highway follows the edge of this Lake, crossing through ‘the neck’ to emerge next to Lake Hawea, separated from Lake Wanaka by a shoulder of mountain. 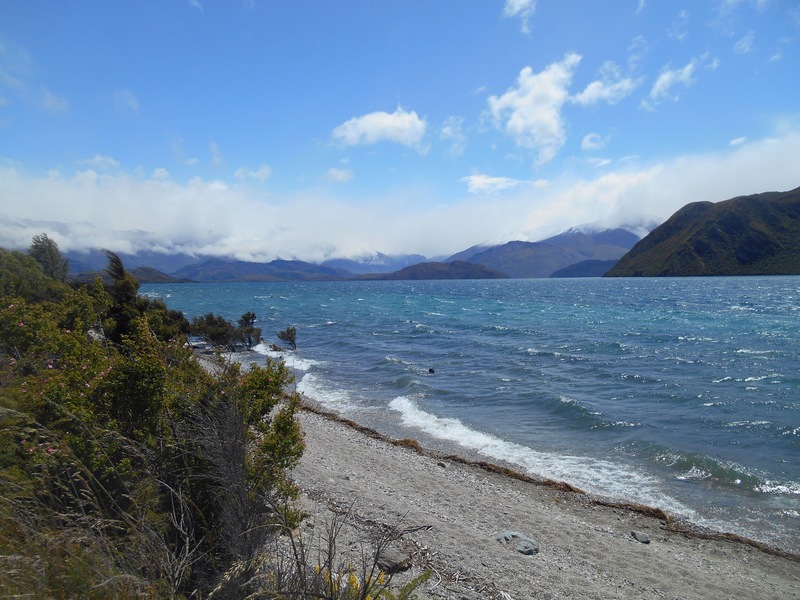 We followed the highway as it climbed and fell, always blue water and incredible snow capped mountains in sight. 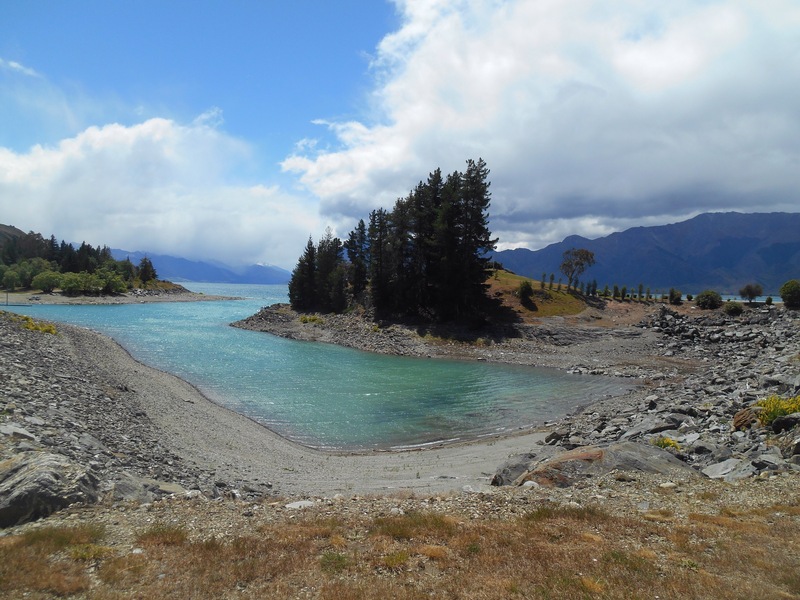 We stopped for a picnic lunch in Lake Hawea town at the bottom of the lake, before the road led us back now to the bottom of Lake Wanaka, where the town of Wanaka sits at the bottom of this 45km lake, framed with the mountains which hold the winters ski resorts. The picturesque lake contributes some quite strong winds to the town where we would make camp for the next little while. 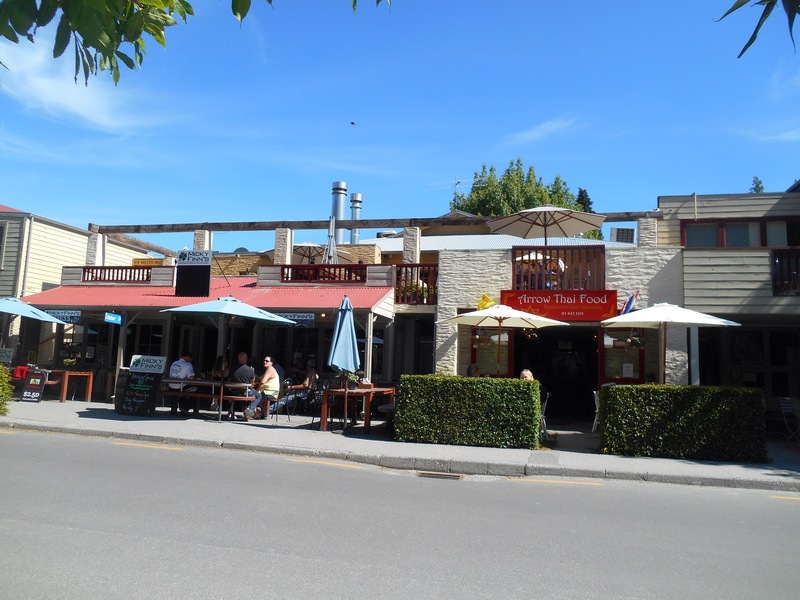 The town sits in the shadow of Mt Aspiring National park to the west and we set off to ride in the shadows of this mount and his relatives. Not sure what he is aspiring to be but the combination of valleys, lakes and rolling field made for a spectacular ride. We were planning to do a walk but an hour out of town, the clouds were threateningly grey and we turned back to ride into blue. 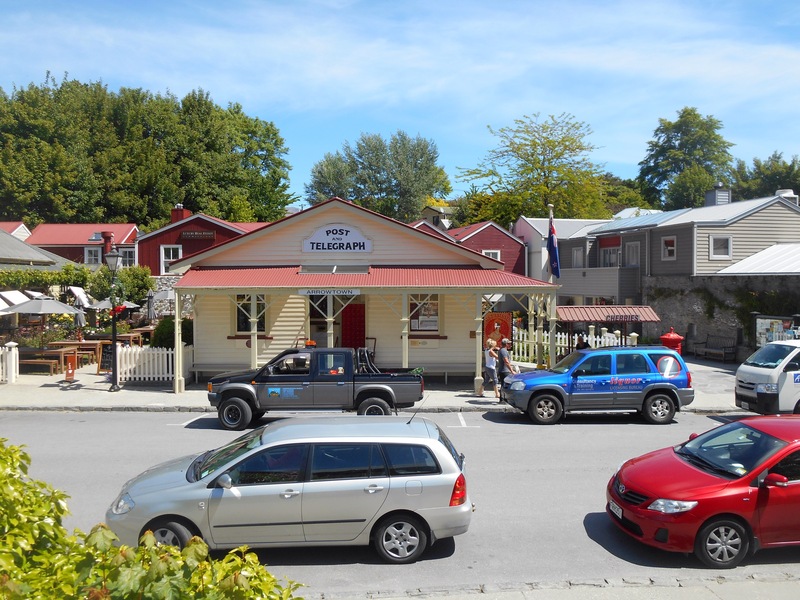 After exploring Wanaka’s cafe culture, we rode lakeside along the banks of the water, each bay revealing a different view, the path lined with pinks, purples and yellows of springtime shrubbery. 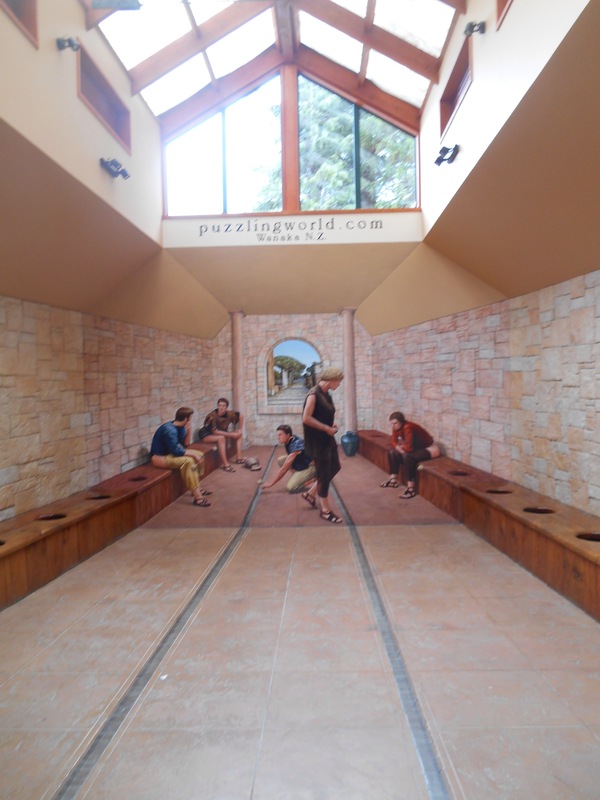 When we had exhausted ourselves we headed back to town via puzzling world, a activity centre with mazes and tricks, mind games and challenges, also with some interesting toilets. Enjoying the luxury of having an oven, we opted for our ‘Christmas dinner’ which, being just shy of December, we were planning on saving. Instead we indulged on Yorkshire pudding, veggie sausages and gravy, followed by mince pies and custard. We had also timed our trip to have a TV to enjoy the Saturday night entertainment, which aptly was Aladdin, having just finished reading the Arabian nights version. That night, our tent was filled with singing and big Disney love. In the morning the sun was high but the temperature brisk as we walked around the lake in the opposite direction, sharing the path with dog walkers and joggers, trying to absorb as much of the incredible view as possible. Alice managed to break the arm off her sunglasses and in an attempt to glue them back on, superglued her finger to just about everything else and admitted defeat. 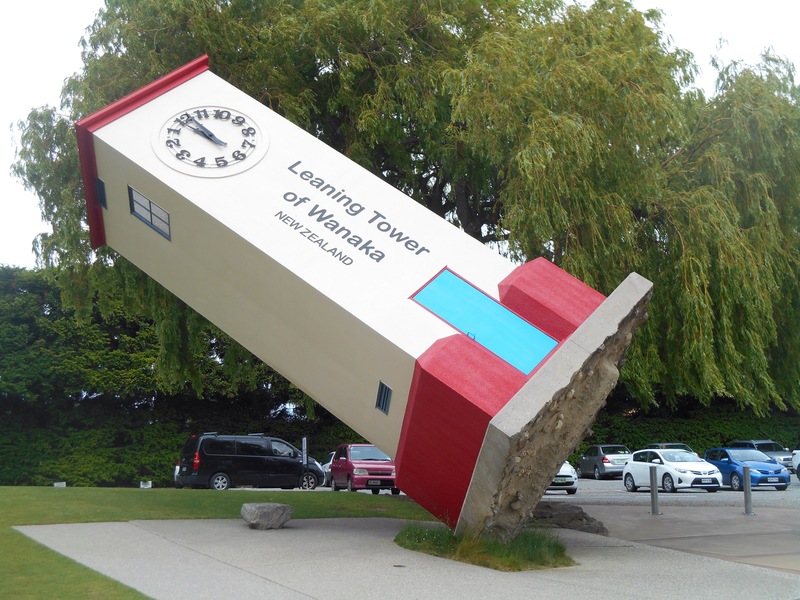 We rounded the morning off with a coffee before regrettably peeling ourselves away from Wanaka through the rolling countryside to Cromwell. 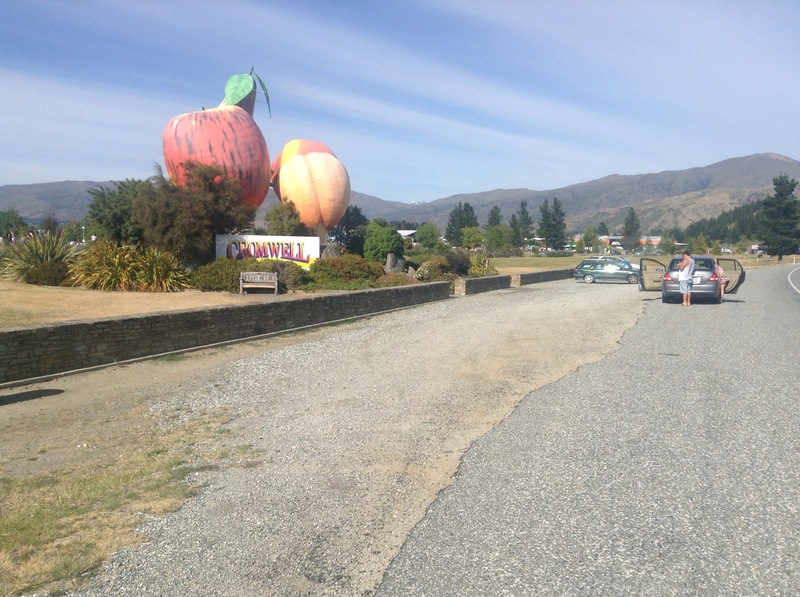 The town was another fruit basket area, town furthest from New Zealand’s coast (a maximum of 79miles at anywhere in New Zealand!) and as a result warm. We passed grapes and cherries, apples and apricots, stopping off to enjoy some of the local produce at the stalls in town. 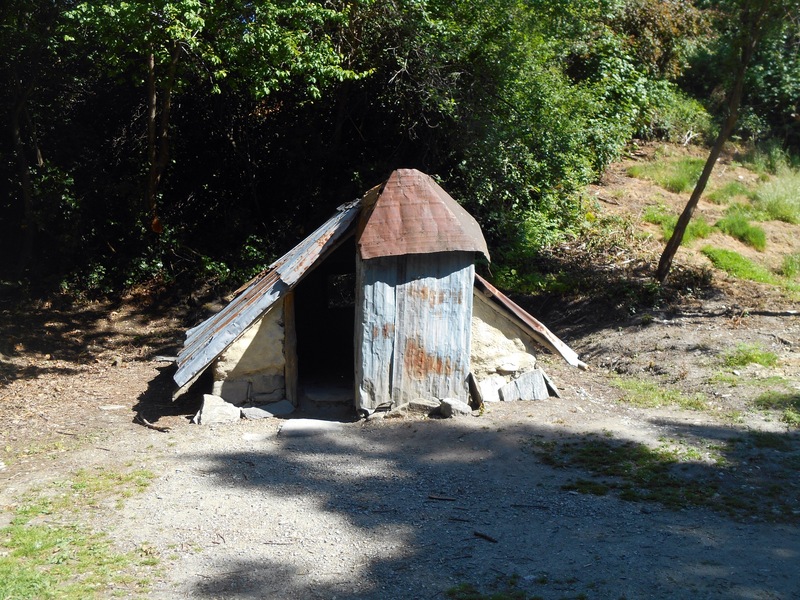 This would be my new home for a few months whilst I cherry pick and the beautiful Lake Dunstan made me very excited to return. Our campground had a play park and bouncy castle, on which we happily spent the evening. 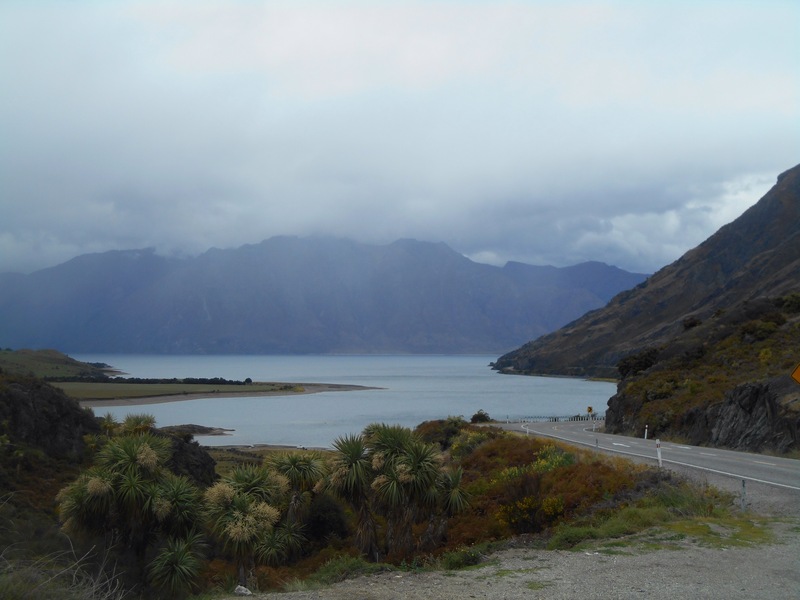 Continuing on the state highway, the road wound and climbed through the Kawarau Gorge. It felt like parts of Western Australia, but every now and again a speckle of snow on top of a distant mountain would show through reminding you that this was very much a seasonal part of the world. Almost as if it was waiting for Alice to list her bike for sale, she encountered her first puncture, and our first of the trip. With me in front and unaware, a kind kiwi put her and the bike in his car and drove to catch me up. We patched up roadside and continued before joining the trail that would take us through Gibbston Valley into Arrowtown, and stopped for lunch at which point her tyre proceeded to deflate and demand repair again. 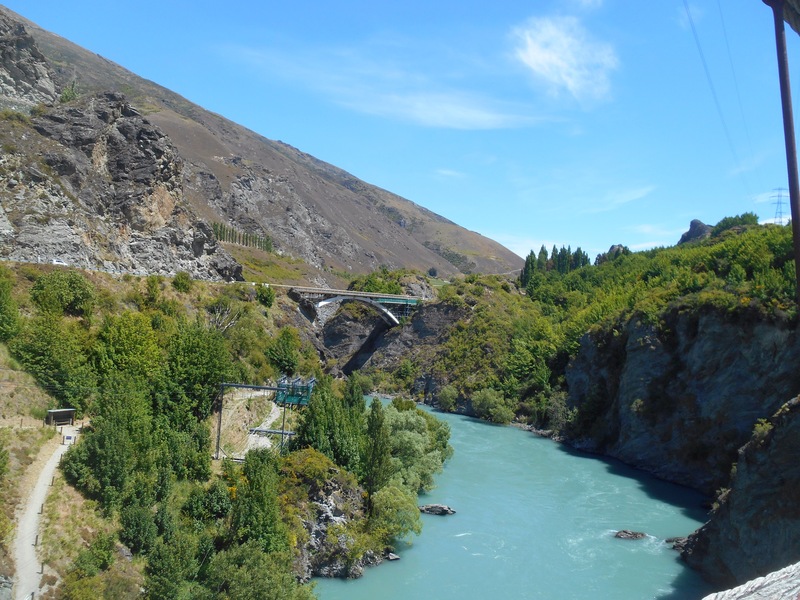 The trail crossed the Kawarau Bridge where many people were bungying, and then continued along the river, crossing again on toe tingling suspension bridges which hung over the gorge. The final stretch followed the Arrow river which emerged in the quaint streets of the once gold settlement. The houses have retained their charm and we perused the shop fronts and cafés of Buckingham street, before opting for ice creams which obscenely, were bigger than our heads. 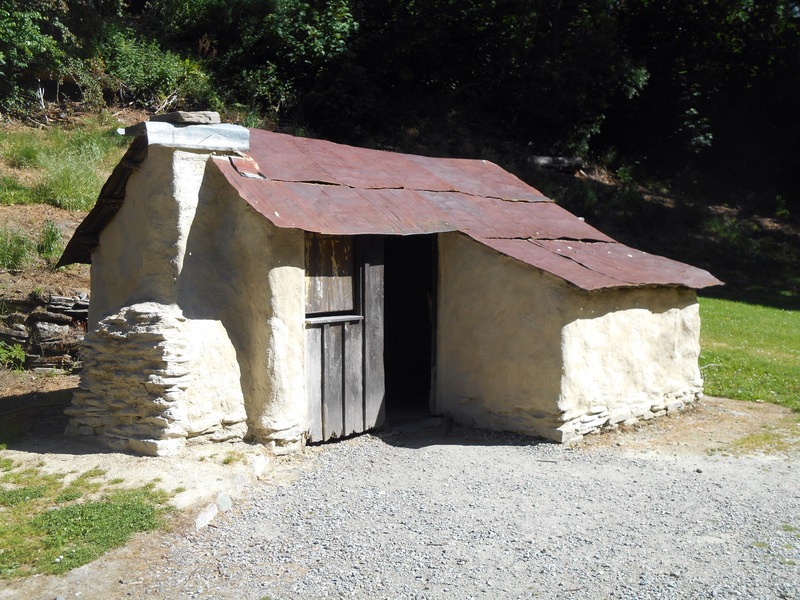 Arrowtown experienced a gold boom, but once the gold supplies ran low in Otago, and many prospectors were heading to the West Coast towns of Hokitika and Ross, the economy sought survival and encouraged many Chinese people to come and work the land. 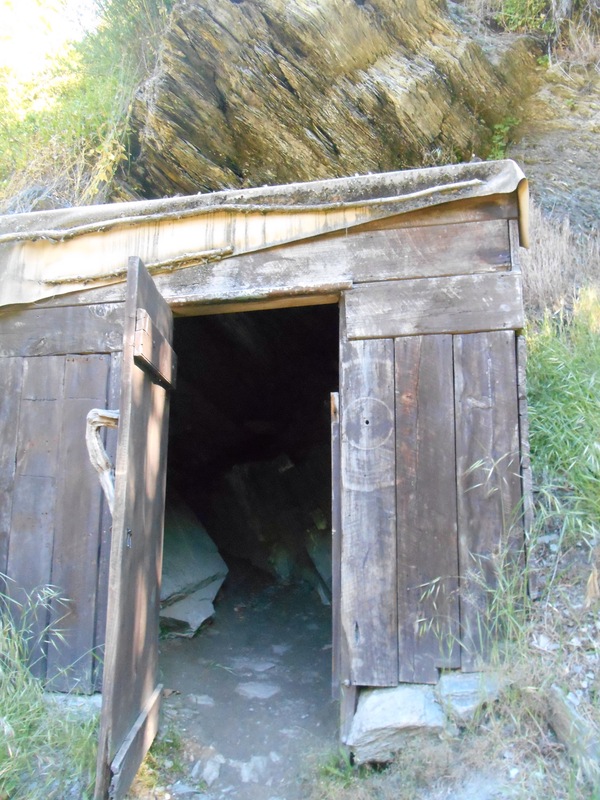 There is a surviving settlement by the river of stone houses, and shelters built into the rock, even a surviving store. Many people made lives and livings here for 20 or so years. In 1890, the countries attitude to Chinese settlers began to change and they began to actively discourage passage, imposing £100 fees and restricting their entry. 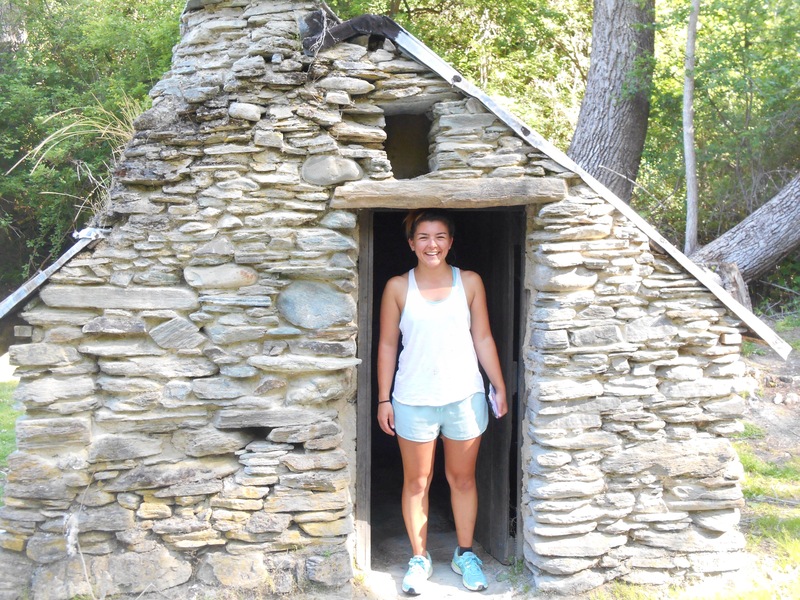 After the day trips leave, the town is quiet and even more quaint, views from each direction, and we made camp for the night.